This luscious dessert offers the comfort of a cobbler with the unexpected combination of mangoes and blueberries, made complete with the inviting flavors - and antioxidant powers - of cinnamon and ginger. FOR THE FILLING, mix mangoes, blueberries and lemon juice in large bowl. Mix sugar, cornstarch, cinnamon and ginger in small bowl. Sprinkle over fruit; toss to coat well. Spoon into 11x7-inch baking dish sprayed with no stick cooking spray. FOR THE TOPPING, mix flour, 3 tablespoons of the sugar, baking powder, ginger, 1/4 teaspoon of the cinnamon, baking soda and salt in large bowl. Add buttermilk; mix well. Drop dough by rounded tablespoonfuls into 6 portions onto fruit mixture. Mix remaining 1 tablespoon sugar and 1/4 teaspoon cinnamon. Sprinkle over biscuits. 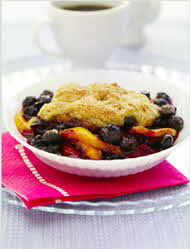 BAKE in preheated 350°F oven 35 to 40 minutes or until fruit is bubbly and topping is browned. Serve warm. Test Kitchen Tip: Use sliced peeled peaches in place of the mangoes. Or, use frozen blueberries, unthawed, in place of the fresh blueberries. Prepare and bake as directed.